Saint George was a Roman soldier from Anatolia (now modern-day Turkey), circa 300 AD, who is venerated as a Christian martyr. Little is known of his early life, but it is generally held that George was born to a Christian family during the late 3rd century. His father was an officer in the Roman army from Cappadocia while his mother was from Lydia. After his father's death, George and his mother returned to her home in Judea (Palestine) where she provided him with an education. George followed in his father's footsteps and joined the Roman army, rising through the ranks to become a Tribune by his late twenties and later Comes (count) as part of the Emperor Diocletian's personal guard in Nicomedia. Diocletian began a systematic persecution of Christians throughout the Empire. Although George was ordered to participate in the persecution, he confessed to being a Christian himself whereupon Diocletian ordered his torture and execution. George suffered various tortures, including laceration on a wheel of swords, but was eventually executed by decapitation on April 23, 303. He was later honored as a martyr and he is commemorated on the date of his death. 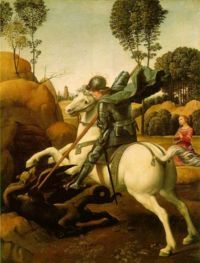 The story for which he is most renowned, however, is the legend of George and the Dragon which was brought back from the Holy Land by the Crusaders. George has since become the patron saint of Aragón, Canada, Catalonia, England, Ethiopia, Georgia, Greece, Montenegro, Palestine, Portugal, Russia and Serbia as well as many cities. In the Russian and Greek Orthodox Churches George is one of the most venerated saints. The banner of St George which is the red cross of a martyr on a white background, and became the flag of England and the White Ensign of the Royal Navy. The country of Georgia has a similar national flag. It came to pass that near the city of Lydia, a dragon decided to take up residence near the water-hole. Unable to collect water the citizens were forced to offer a human sacrifice to distract the dragon. The victim was selected by the drawing of lots and one day the king's daughter was selected. Although the king was distraught and begged for her life, the citizens insisted that she be treated like everyone else. She was sent out to face the dragon but the wandering George arrived and seeing the princess's plight engaged the dragon and slew him. In gratitude the citizens abandon their traditional paganism and converted to Christianity. This page was last modified on 3 April 2019, at 13:09.